I’m so excited! I will be launching a new BOM that will start in January, 2018. “Hugs and Kisses”, designed by Sue Garman, is a quilt that I have been on my mind for a while. Here are a few of the 12″ blocks. This quilt is a perfect project for beginners and experienced stitchers alike. I cannot wait to finish it:). You have until December 15 to sign up on the website. The fabrics you will receive are exactly as shown below. If you are interested in signing up for Friends of Baltimore/Baltimore Squared Block-of-the-Month, you still have time. Registration closes November 1. You can check out the details on the website. In my spare time, I am hand-piecing my “Smitten” quilt. Here are the first 3 blocks. My plan is to make this “eye-spy” type of quilt for my granddaughter, Gracie. Of course, once I started hand-piecing, I got a little sidetracked with my Inklingo shapes and decided I needed to start working a quilt made entirely of 60 degree diamonds. Honestly, I can’t stop myself! 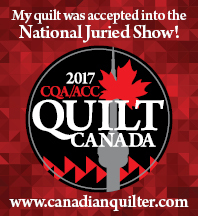 So excited to announce my quilt, To Everything There Is A Season, has won the Award of Excellence in Applique at Quilt Canada 2017! This quilt is superbly machine quilted by Rose Bell of Fancy Feathers. It was a thrill just to have my quilt juried in, but to win an award is definitely the icing on the cake. For those that have asked, the complete pattern for this quilt will be available on the website mid-July. We are fine-tuning a few of the blocks, so sit tight! First, I taped 6 copies of the swags together (each border has 6 swags on it). Then I placed the border fabric on top of the paper pattern and traced the swags. I used plastic to make a template of the swag to make tracing much easier and so much faster. …and Ta Da! Let the stitching begin! Happy New Year! Here is the 10th block of “To Everything There Is A Season”, a BOM I launched last April. If you haven’t seen the blocks, here they are! The blocks are available on my website Simple Bird Studio. I am sooooo close to finishing Sue Garman’s “Friends of Baltimore”! Once the border is finished, I just have to do the two corner blocks. Then add the sawtooth border. Then quilt it. Then bind it. Remember, one stitch at a time!! Where did October go?!? It’s time for me post the 8th block of “To Everything There Is A Season”, a BOM I launched back in April. If you are new to my blog and you haven’t seen the blocks yet, here they are! All of the patterns are available for purchase on my website Simple Bird Studio. The patterns are available either as a digital pattern (which I will email to you) or as a paper pattern (which I will mail to you). The choice is yours. Here are a few close-up photos. The yellow centres are made of Ultra Suede. This is where I purchase my Ultra Suede. I love the little bit of texture that Ultra Suede adds! I also stitched around each yellow centre with one strand of gold embroidery floss. I added a few French knots to the flowers, but I used 2 strands of embroidery floss for those. I also used one strand of brown floss to embroider around each of the ovals on the vase and around the darker handle on the right side. Fancy! Here it is the beginning of another month and that means it’s time to post the next block of a block-of -the-month I launched back in April. To see the last 6 blocks, click here. For those that have ordered the patterns, thank you very much!! I am really overwhelmed by the positive response to the patterns. I’ll answer some FAQs…there will be 12 blocks in total. The blocks measure 18″ x 18″ without the seam allowance. There is be a beautiful center medallion that combines elements of all the blocks. It is spectacular! And, finally, there will be outer borders. The finished size should approximately 90″ square. There are 2 ways to order the pattern, which are available on my website. You can purchase a full size paper pattern and I will send it to you in the mail. The cost is $10.00 and includes shipping in Canada and the US and also includes a colour picture of the block or….you can purchase the downloadable pattern for $7.00. Some people have had trouble downloading the pattern (you will need Adobe Reader to download the patterns) and for those people, I sent a 6 page PDF of the pattern which seems to have worked well. This month I have included the 6 page PDF in the link. along with the full-size pattern and a colour picture. Hopefully that works for everyone! I must admit this block intimidated me because of the shading and I just didn’t know if I could carry it off. I procrastinated all month long (not like me at all!) and when we came back from Barbados I finally started the block. That way, I only had one week to make the block. Talk about pressure, but sometimes that is the only way to get things done!! Can anyone relate to that? …then I added a few apples and thought they looked pretty darn good! So good, in fact, that I added a whole basket full of them. I knew I had some wood grain fabric left over from a BOM I did about 10 years ago and I searched my sewing room until I found it. Next, I added the straw…..
…and finally, a sweet little bird! I am so thrilled to show you the first block of “To Everything There Is A Season”. I have chosen to start with the “Spring Urn” because I am so sure that spring is just around the corner! “To Everything There Is A Season” is a full sized quilt designed by MTDesigns exclusively for Simple Bird Studio. The quilt consists of twelve 18″ blocks and a center medallion that measures 36″. The outer borders have not yet been designed, but I promise, they will be spectacular! Here is how it works….For the next 12 months, I will be presenting a new block on the first day of the month. The center medallion and outer borders will be available after all 12 blocks are available. The cost is $7.00 per pattern. The pattern for “Spring Urn” is now available on my website Simple Bird Studio. Just click on “patterns”. The good news is…you can start at anytime. And, you don’t have to purchase all of the patterns (but I would love it if you did!). Perhaps you would like to stitch a seasonal wallhanging…or two! The choice is yours! When you purchase a pattern, you will receive an email with the pattern attached, along with a colour picture of the block. The pattern can then be printed and tiled. Spiffy!